Since they were discovered, the general public has always wanted to know what Neandertals look like, and many artists have attempted to show us. The results have been remarkably variable, and a few of them are shown on this page. 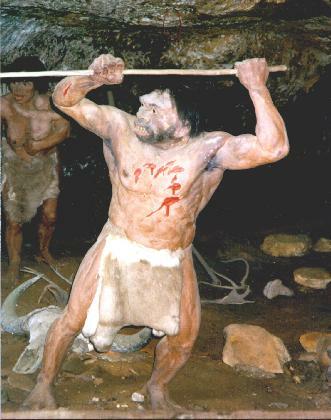 Generally, older pictures tend to show Neandertals as more ape-like and primitive, while modern depictions are more like modern humans. 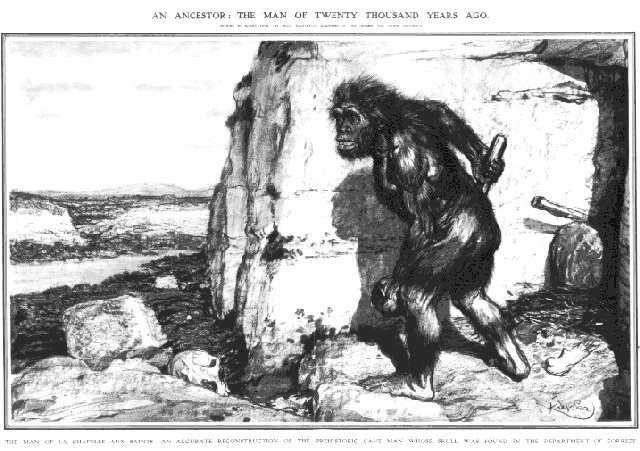 The following reconstruction of the La Chapelle-aux-Saints Neandertal skeleton, discovered in France in 1908, was published in L'Illustration in 1909, and in the Illustrated London News about a week later. It was done by Frantisek Kupka, based on the work of Marcellin Boule. 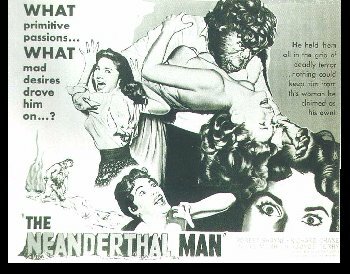 This awesomely bestial figure wildly exaggerates the primitiveness of Neandertals. While Neandertals would look unusual by our standards, with a short and very powerful build, receding chin and forehead, protruding midface and large nose, it's safe to say they looked nothing like this caricature. 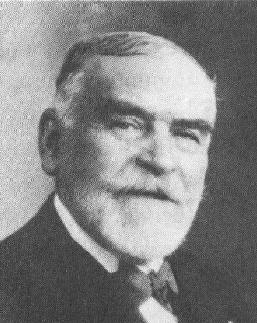 "Hairy or grisly, with a big face like a mask, great brow ridges and no forehead, clutching an enormous flint, and running like a baboon with his head foreward and not, like a man, with his head up, he must have been a fearsome creature." 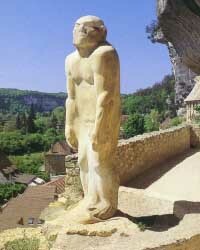 A famous Neandertal representation is the statue done by Paul Darde in 1930, which stands outside the Musee National de Prehistoire in the village of Les Eyzies, France. It gives an impression of sheer strength and endurance, which is probably quite accurate. This statue is more realistic than the previous representations, without the bent knees and stooped posture. It still has the big toe diverging from the others, an ape-like feature which Neandertals did not have. The model on the left is from the cliff site of Roque St. Christophe, and is probably some decades old. The model on the right is by sculptor Stephen Brois, and was done for the American Museum of Natural History in the 1990's. 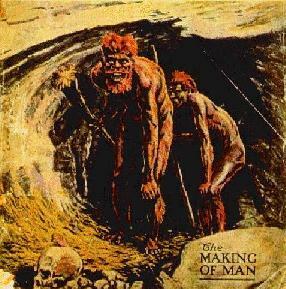 In recent years, portrayals of Neandertals become less sensationalistic, reflecting the fact that Neandertals were not ape-men, but were, despite minor anatomical differences, essentially like ourselves (which does not necessarily mean that they belonged to the same species as modern humans). These drawings are the work of scientific illustrator Jay Matternes, from the October issue of Science 81 . 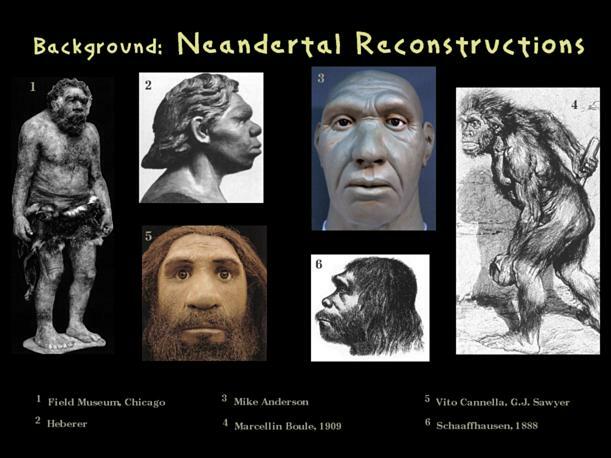 A page of Neandertal reconstruction images, copied from a now-vanished website.